Everyone always says that “Time flies when you’re having fun.” As I think about this past year, no matter the ups or downs that I have experienced, fun is a great word for it all. Sometimes bad comes out of having too much fun. Sometimes having fun creates the good. And if this past year has taught me anything, it’s that even in the most stressful or important times in our lives, it’s still okay to have fun. I bring this random thought up due to reflecting on The Placement Exchange (TPE) I experienced a year ago this week, and the hope that others will have as good of a time as I did. While the job search can be such a stressful and time consuming part of our lives, there is always a silver lining. Last year, The Placement Exchange was in Philadelphia, and many of those in my graduate school cohort signed up to go. Philadelphia was a town I’d never been to, and I couldn’t wait to visit! But of course, my mind was more on applications, interview attire, questions to ask potential employers, etc. than on seeing the Liberty Bell. 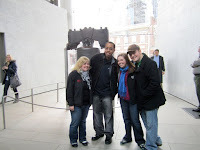 A fellow graduate student, Brandin Howard, and fellow SAFirstYear bloggers Amber Phillips and Charle Cherry and I decided we would all head to Philly together and give the whole TPE adventure a try! Luckily, TPE was over our Spring Break, so we were able to take an extra two days to drive there and site see. As you may have read in one of my previous posts, I was all about traveling to multiple states while in graduate school, and being able to drive through Ohio, West Virginia, and Pennsylvania with some of my closest friends was the definition of an adventure. Trying to fit all of our suitcases and pressed suits in the back of my Subaru Outback was quite the feat, along with agreeing on what tunes to listen to for the twelve hour drive. While Amber and Brandin slept away the drive in the back, Charle and I were co-captains and took on the road together. Once we got to Philadelphia, we came to the quick and obvious realization that our hotel room had one bed, and seeing as the hotel was full that week, we were not able to change rooms. Luckily we were able to get an extra pop-up bed, and a plethora of pillows, and the boys graciously let Amber and I share the bed while Brandin slept on the pop-up bed and Charle made a nice little bed of pillows in the corner. Not ideal, but we made do with what we had. We also experienced a day later that while it was down pouring outside our hotel window, the window was also inviting that weather inside. We had water soaking the carpet around the window, which was also where Brandin’s clothes had been placed. Needless to say, even though it took us a while to figure out where the smell of mildew was coming from, we tried to take care of it right away. The hotel’s suggestion? Put a fan on it. So that we did. 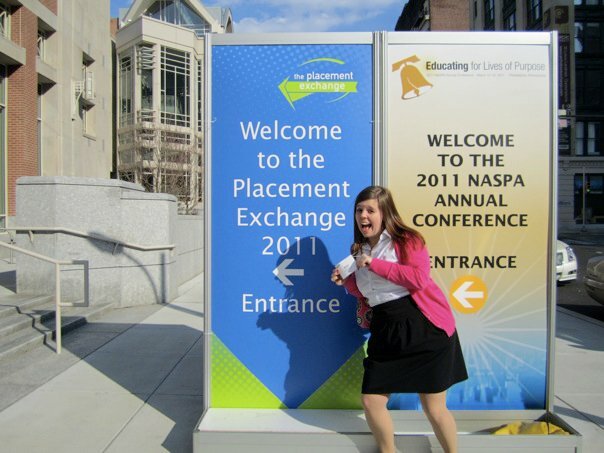 But these aren’t the first memories that come to mind when I reflect on TPE 2011. Yes, there were the interviews. The hours of waiting in the candidate room, the multiple donuts from Dunkin Donuts next door, but there were also great memories outside of that. Seeing the Liberty Bell, Love Park, the U.S. Mint, and the State House where the Constitution and Declaration of Independence were signed were highlights, to say the least. Wandering around the less populated areas of Philly to find Edgar Allen Poe’s house was interesting and a good learning experience. And the less touristy things, such as grabbing dinner with the cohort on the rainiest night, or getting some froyo and walking around to look at murals in the city in between breaks. These are the times I will remember. To those beginning your professional career today by interviewing at TPE- good luck. Breathe. And they really won’t look at your cuticles, I promise. Be you, and have fun with it. Talk about yourself like it’s your job, because right now it kind of is. TPE is a very unique and exciting experience, and a great tool for meeting those in our field. A woman I met while waiting for an interview, who ended up being from Morocco, is now one of my closest coworkers in New Mexico. Student Affairs is a small world. Enjoy it. And enjoy your time in Phoenix, or wherever the job search may take you. You deserve it.